Sat, Mar 9 2019 12:37 PM by pdb1. 335 replies. PLEASE TAKE A FEW MINUTES TO SCAN THROUGH THIS THREAD , CLICK ON A COUPLE URL'S . GO ALL THE WAY TO THE LAST PAGES AND MOST CURRENT POST'S . IF YOU LIKE WHAT YOU SEE . PLEASE MESSAGE ME WITH YOUR INTENT . THAT WAY I KNOW YOU ARE INFORMED . I WILL BE HAPPY TO SEND YOU AN INVITE . THANK YOU PAUL . Valley of the Sun Casual Club C C invites players looking for a new CC . To come take a look at ours . We are an all tiers CC ..
We have fun tourneys at all levels . You can make your own tourneys or I will make them custom for you . We have a good friendly owner me , Paul . . Message me with questions , suggestions , concerns . For the use and enjoyment of all . But mainly as VOTSCC's free for all to use website . Slowly incorporating its many awesome forum features into VOTSCC's go to place for chat , tutorials , information , replays , hall of fames , matches and whatever else this well made , user friendly , has everything that wgt doesn't , open to all to join whether or not you belong to VOTSCC are welcome to use the free chat room ( as wgt does not provide this ) for anything you may desire . I have created a page in our website that I have embedded the Saturday and Sunday brackets in . With the chat right in between them . This is very important .Please read the following posts before you exit .Especially the last page . This is a CC you cannot pass up at least taking a look at . We are still looking for players . Right now with 28 members . 28 very good members . We still need more members of different interests to continue with some of our formats . Good members do not have all the same interests . They do not have to like or even participate in every thing we present . For instance . We have 13 on Team VOTSCC INTERPLAY . That is fine . But the recommended default amount is 16 . We have 6 players playing our Daily BLITZ . Which takes us through the 25 courses 1 a day M - F for 5 weeks per season . We are in our 13th season . 65 consecutive weeks . We also have a VOTSCC SKILLS CTTH challenge . These are not daily but run 72 hours . There are 35 CTTH courses . We have 4 in CC Match play and Stroke play challenges . Members challenge the title holder . The winner is the champ and sports the title on their wall until they are challenged and beat . 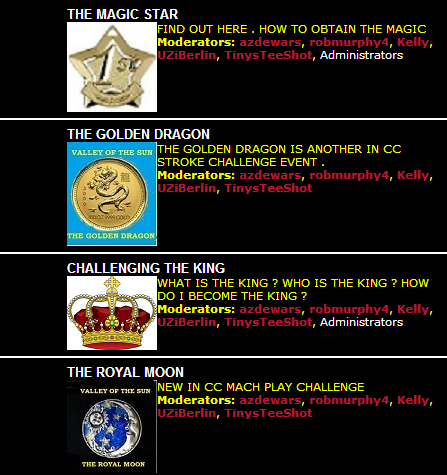 We also have embedded live Brackets from Challonge in our website . That play live with a chat box right below the bracket so you don't have to go anywhere else except to WGT to invite and play your round . We also have very cool CC tourneys and brackets . And many more . Obviously some will be drawn to different events . We just need more players til fill these GR8 events and keep them alive . Nothing is mandatory or required . But silence is not acceptable . The possibilities are endless . Everyone is equal in our CC . Input and ideas are encouraged and any opinion on anything in any direction is heard and respected . A few more here and a few more there is all we are looking for . There is quite a lot to keep ones interest . Here's a Thank You that you very much deserve. Having fun in the CC in the short time I have been here. When a new player joins and starts playing in the CC tourneys . 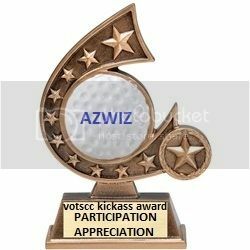 This is one of the awards you will receive . Not to mention other special awards like harry's elite " wgt good guy " award . Sent in a request, looking forward to playing in CC tournaments, I really don't play in any other tournaments. Although I am a happy member of another country club, I think you guys did a wonderful job with your website/forum. Nicely done. Mr monk has been eveyrwhere, good luck with your adventure !! I wish you all the success in the world ! !